The funds you raise for the Congenital Heart Walk directly benefit The Children’s Heart Foundation’s mission to fund the most promising research to advance the diagnosis, treatment, and prevention of congenital heart defects (CHDs). Since 1996, with your help, The Children's Heart Foundation has funded more than $11.1 million in CHD research across 103 projects. In 2019, we’ve got a great new logo and artwork, and great new incentives to inspire and reward you for your fundraising success! 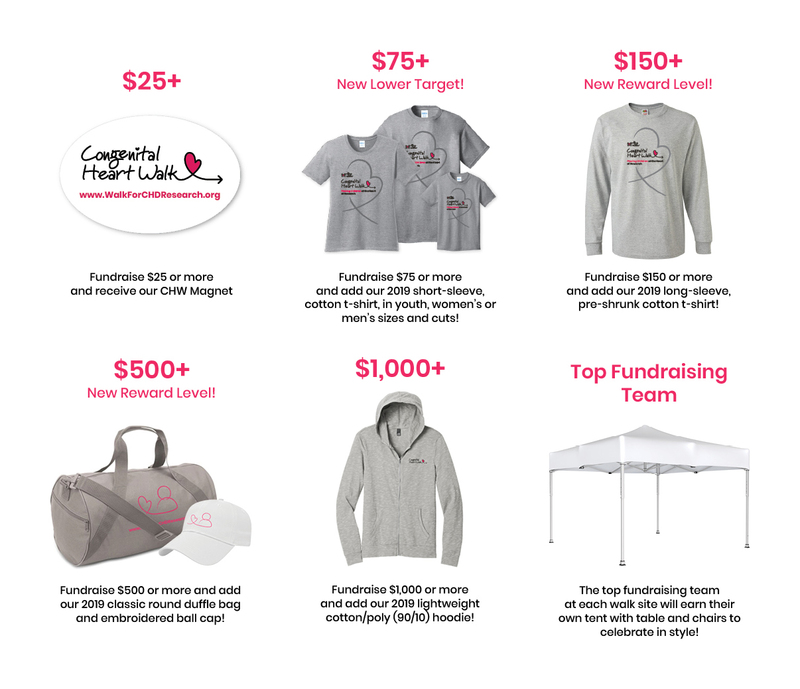 Click here to view the 2019 Congenital Heart Walk Fundraising Incentives! After you’ve viewed our incentives, download our 15 Fantastic Fundraisers and our Team Captain Success Guide to support your fundraising efforts! Happy walking and fundraising, and thank you for Placing Children at the Heart of Research!